Royal Thunder return after a great sophomore record Crooked Doors as their brand of emotive, vocal driven hard rock explores new musical pathways. Wick balances somewhere between gospel and medium paced hard rock as their harder days of CVI are in the distant past. “Burning Tree” is where this albums begins and it is a slow rocker with Mlny Parsonz’ powerful vocals. Her beefy style works well within the composite parts of the band. Whether it be to harmonize with the guitars or act as a bridge between choruses, vocal effects dominate the emotionally heavy side of the album with songs like “April Showers’ ‘Tied,” “Plans” and “Push.” The majority of these songs are met with equally stirring and beautiful guitar work creating an absolutely immersive atmosphere of self-realization and clarity. 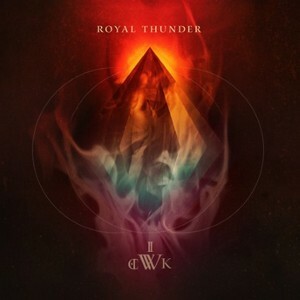 This isn’t to say that Royal Thunder doesn’t still flat out rock in a general sense either, take “The Sinking Chair” and “Turnaround,” for example. Right from the get-go there are bombastic drums and a guitar riffs that meets it head on. The guitar solos towards the middle section of the former show massive talent and more added depth to this very dense package. The latter features more guitars that harmonize with Parsonz and add to that clarity mentioned before. This song manages to “find their way” as does the whole package that is Wick. It may not grab you initially, but it will eventually. Wick is such a wonderfully executed album, one that bands never get to make these days. Royal Thunder continue to evolve and with album number three they are firmly their own beast and we benefit from it with each new listen. An early contender for album of the year in 2017.